There is a deep and rich Jewish cultural heritage in Italy, and a Jewish wedding ceremony here can be moving and memorable. If you want to get married with an Orthodox ceremony in Italy you can choose among the historic and splendid Orthodox Synagogues located in Florence, Naples, Venice, Rome and Trieste. You will need permission from your home rabbi, who will need to prepare all of the necessary religious paperwork to be delivered to the Orthodox Italian rabbi. Italian Synagogues prefer to speak directly with the couple about this aspect of their wedding. This type of ceremony in Italy can be legally binding. A modern Jewish wedding ceremony in the Reform tradition can be held at virtually any location in Italy. However, in this case the ceremony will only have a religious value. You would still need to have a civil ceremony for a legally binding wedding. We can help you to produce all the necessary documentation (for more info read here). You can choose to bring your own rabbi, or we can arrange for a Reform rabbi to conduct the ceremony. 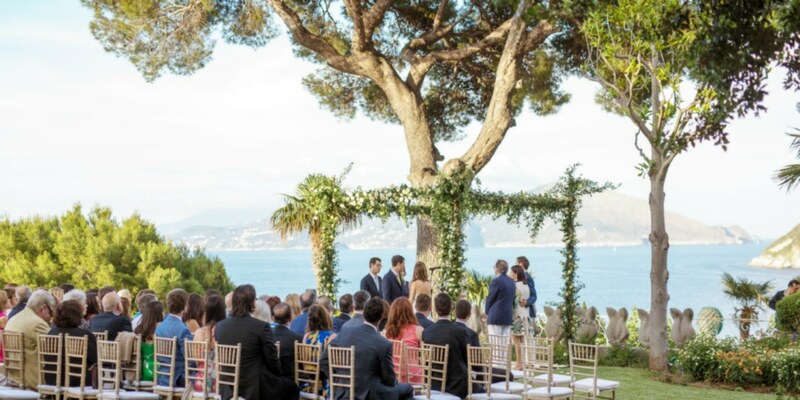 Getting married in Capri with a Jewish ceremony (Reform or Interfaith) can provide a unique and meaningful experience. Your ceremony can be held in a secluded garden, at a charming private villa with a spectacular view of the sea, on a panoramic terrace, in an ancient castle, at a modern and elegant hotel, or at a variety of other locations. We can help you choose a location that will provide the perfect venue for your special day. Wherever you decide to hold your ceremony, Capri Moments will carefully design every detail. We will focus our talent and passion on creating your ideal wedding based on your individual tastes and personality. No aspect of your Jewish ceremony and reception, will be left to chance. From a beautifully decorated chuppah (huppah) covered with flowers and elegant fabric, to a renowned catering service specializing in delicious kosher food, from a custom made ketubah enriched with illustrations and calligraphy, to a talented Jewish wedding party band that will delight your guests, we will oversee every detail. If you are dreaming of tying the knot in Capri, contact us to discover the most fascinating venues for your one-of-a-kind Jewish wedding.